This section hosts aromatic and medicinal plant species which are used for flavoring, medicine, essential oils, beverage base and honey production. 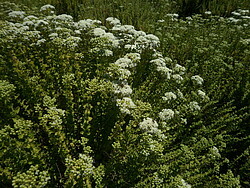 Their therapeutic, culinary, and cosmetic properties have been reported since ancient times. 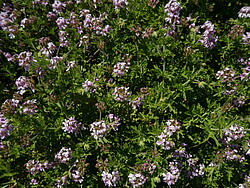 Visitors have the opportunity to see and smell aromatic species such as “flavoring species” specifically referred to culinary herbs (or kitchen herbs), such as rosemary (Rosmarinus officinalis), garlic (Allium sativum), onion (Allium cepa), common thyme (Thymus vulgaris) and spearmint (Mentha spicata). Moreover, medicinal plants are grown in this section such as aloe vera (Aloe vera). Medicinal features are present in different parts of the plants like root, stem, bark, leaf, flower, and fruit. 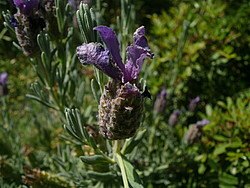 Species, such as common levander (Lavandula angustifolia) and spearmint have been used for extraction of essential oils due to their concrete volatile substances. Herbs and shrubs which are used for beverage base could also be observed by visitors, such as sweet majorana (Origanum majorana) and Cretan dittany (Origanum dictamnus). 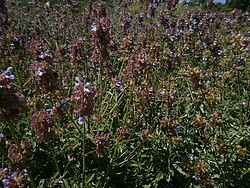 Flowers of bush lavender (Lavandula stoechas), rosemary (Rosmarinus officinalis), conehead thyme (Thymbra capitata) and sage (Salvia pomifera) attract bees resulting in honey production.